Hefty, brash, menacing villain of gangster as well as western films, the often crude, thick-necked Ted de Corsia was an actor ever since he was six years old in touring companies and on radio before making a memorable film debut as killer Willie the Harmonica in 1948’s “Naked City”. 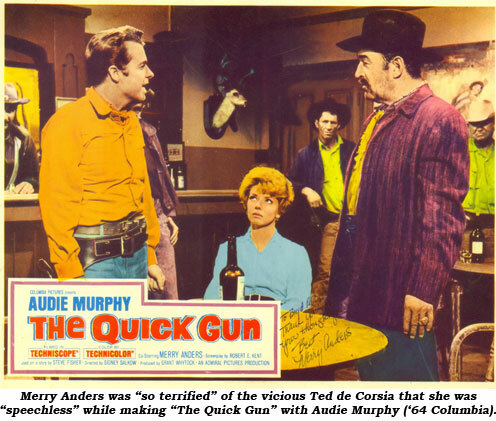 and raucous, gravelly voice made him perfect casting for street thugs and outlaw gang leaders. Edward Gildea de Corsia was born September 29, 1905, in Brooklyn, NY, the son of Edward G. de Corsia, a vaudeville actor from Texas, and Helen O’Rielley of New York. Ted attended school at various stopovers in New York, Philadelphia, Chicago, Detroit and other cities. He gained early experience as a child in touring road companies which led to a well noted career in radio beginning around September ‘39 when he became Sergeant Velie on CBS’ “Adventures of Ellery Queen”. Throughout the ‘40s his raucous voice was heard on “Big Town”, “Cavalcade of America”, “The Shadow”, “Ford Theatre’, “Nightbeat”, “Richard Diamond”, “Terry and the Pirates” (as Flip Corkin), among others. He starred on two short-lived programs, NBC’s “Joe and Mabel” (‘41-‘42) and CBS’ “Pursuit” (‘49-‘50). When film and TV work began to occupy more of his time, he dropped out of radio in the early ‘50s. 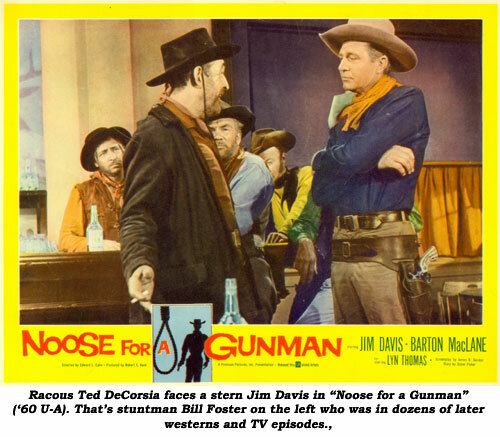 Among de Corsia’s evil presence in 60 some movie credits are 17 westerns including memorable heavies in “The Outriders” (‘50), “Gunfight at Dodge City” (‘57), “The Lawless Eighties” (‘57), “Gun Battle at Monterey” (‘57) and “Noose for a Gunman” (‘60). 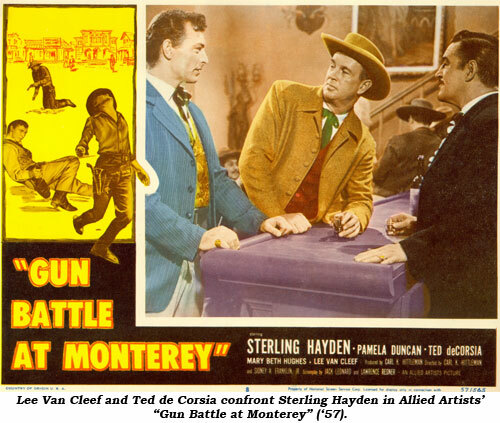 Among his hundreds of TV credits, over half are westerns ranging from “The Lone Ranger” to “Gunsmoke” in type. 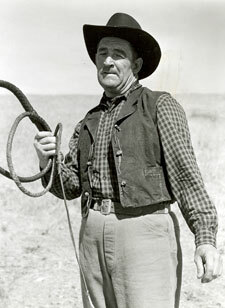 He also menaced the stars of “Broken Arrow”, “Tales of Wells Fargo”, “The Californians”, “Casey Jones”, “Trackdown”, “26 Men”, “Mackenzie’s Raiders”, “Frontier Doctor”, “Rough Riders”, “Bat Masterson”, “Tate”, “Wanted Dead or Alive”, “Lawman”, “The Dakotas”, and many others. 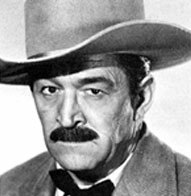 He may not seem the type, but as he aged, de Corsia became quite adept at portraying Indian Chiefs which he did with regularity in “New Mexico”, “Mohawk”, “Oklahoma Territory” and on TV’s “Sugarfoot”, “Rawhide”, “Daniel Boone”, “High Chaparral” and “Have Gun Will Travel”. Ted was first married to Mary Robertson. They divorced in ‘35. He married Rachel Thurber in ‘39. They had two daughters; one of them was named Deidre. De Corsia was divorced and living at 320 North Lapeer Ave. in Beverly Hills, CA, when he died April 11, 1973, at 67 of cerebral thrombosis. He’d been a patient at West Valley Com-munity Hospital for two weeks prior to his death. His re-mains were cremated and scattered at sea.